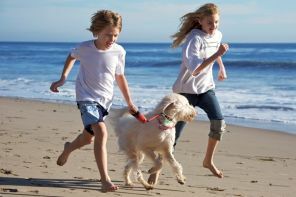 Keeping your pet happy and healthy during your Outer Banks vacation is vital. Please be courteous and clean up after your pet. All pet waste must be collected immediately and deposited in appropriate containers. Be familiar with the Outer Banks leash laws. They are in place to ensure you, your dog and others on the beach have a good time. Please contact each town and the National Park Service for any changes to pet policies. Dogs are allowed on Currituck County beaches year-round, but they must remain on a leash. For more information, please visit http://www.co.currituck.nc.us/ . Dogs are allowed on the beach unleashed, but as a matter of public safety and courtesy, they should be under the watchful eye and contact of their owner. Duck beach accesses are privately owned by individual Home Owners Associations, and access is limited to Homeowner group residents and guests. Please visit townofduck.com for more information. Dogs are allowed on the beach before 9 a.m. and after 6 p.m. from May 15 - September 15. Year-round leash law. Dogs must be on leashes no longer than 10 feet. All pet waste must be collected immediately and deposited in appropriate containers. The same rules apply during all hours in the off-season. Please visit southernshores-nc.gov for more information. Dogs are allowed on beach and must display a current rabies tag. Owner/handler must remove feces and possess a bag/container for waste removal at all times. From the Friday before Memorial Day until the day after Labor Day between the hours of 10 a.m. and 6 p.m., dogs must be on a leash not exceeding 12 feet. Dogs may be taken off the leash only if they will not disturb other people on the beach and must be controlled by the handler, who must remain within 30 feet of the dog at all times. Leash must be with owner/handler at all times. Please visit townofkittyhawk.org for more information. Between Memorial Day and Labor Day of each year, no dogs shall be permitted on the public beach between the hours of 9:00 a.m. and 6:00 p.m. unless being used to aid a handicapped person. At all other times, no dogs shall be permitted on the public beaches except upon a leash and under the control of owner or handler. Please visit kdhnc.com for more information. Dogs are allowed on the beach year-round as long as they are restrained by a least not exceeding 10 feet. Please visit townofnagshead.net for more information.